Robust hose trolley HT 80 m with adjustable steel frame and ergonomic grip. Robust, rust-resistant steel frame and drum. With hose guide and smooth running hand crank. 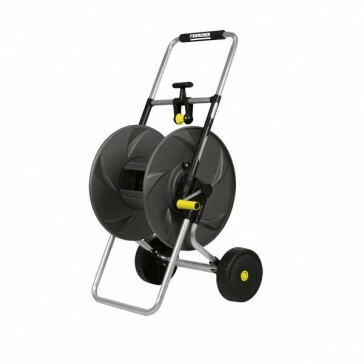 High-quality hose trolley HT 80 with steel frame ideal for watering medium-sized to large areas and gardens. Metal frame and drum. Both elements are rust-resistant and extremely robust. Height adjustable frame with non-slip, ergonomic grip for ease of use. Further features: hose guide, smooth running crank handle and angled hose connector. Including two Plus universal hose connectors. Everything you need for the perfect garden. Kärcher innovative hose storage systems set new standards in function, design and quality. Modern, compact hose trolleys allow quick and easy hose winding without manual guide. Kärcher hose trolleys are compatible with all available click systems.